In the latest chapter of the ongoing U.S.-China saga over intellectual property rights, U.S. Ambassador Gary Locke recently criticized China for its lax enforcement of international laws protecting patents, telling Beijing that its serial failure to honor such laws not only hurts trade relations, but is stifling innovation within China’s own economy by creating an atmosphere in which the country’s own entrepreneurs are reluctant to take the risks necessary for a healthy economy to thrive and grow. Predictably China dismissed charges of allowing widespread intellectual property theft, claiming progress in the area and accusing the U.S. of relying on an old trope rather than engaging in productive dialog. Meanwhile, as the two economic frenemies toss their economic hot potato back and forth, innovators everywhere still struggle with the challenges of protecting intellectual property and other critical business data in a world where digital communications and mobility are central to commerce – and to putting data at risk. A recent Ponemon Institute study found that, under pressure to accommodate data mobility, many companies are leaving themselves vulnerable to data breaches because they have not also implemented security measures to adequately protect that information. If that’s true of mid- to large-sized enterprises, what about smaller companies and individuals who are competing in the marketplace of ideas with fewer resources for data security and intellectual property protection? 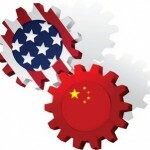 No matter what sort of resolution the U.S. and China come to (if they ever do) around IP protection and copyright, it remains incumbent upon organizations and individuals to remain vigilant in the safeguarding of their own trade secrets, critical business data, and other sensitive information. That includes maintaining a current awareness of the various risks involved and taking appropriate steps to ensure information is shared securely and appropriately. Protecting the documents and files in which those secrets are contained is, of course, an important part of that effort. When it comes to the integrity of your IP, you are your own best protection.